These days, coffee is more than just a morning ritual. It is a science; it is an art form brewed to perfection. Coffee shops and at-home brewers have increasingly turned to methods like the French press instead of drip coffee makers, seeking a perfectly balanced and flavored drink suited to their tastes. Different French presses cater to different consumer preferences, so it is important to know what features to look for before buying. Below, we review the Le Creuset French Press and compare it to similar French press models on the market today. What Is the Le Creuset Stoneware 27oz. French Press? The Le Creuset French Press is a 27-oz functional French press made of stoneware and coated in enamel. 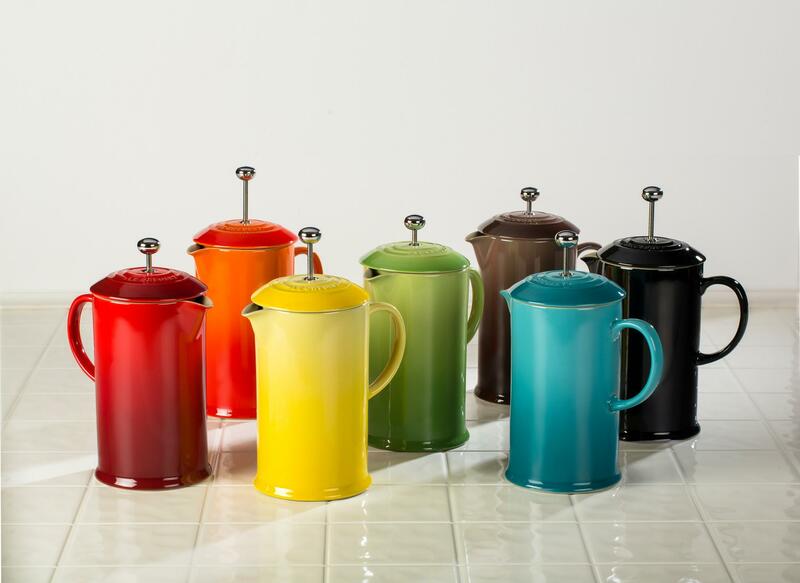 The Le Creuset French Press is distinguished by its attractive, colorful exterior and thin, rounded pouring handle. The exterior ceramic-like design stays true to the Le Creuset brand, while the inside pays respects to the traditional French press model. A stainless steel-tipped plunger tops off the lid's exterior, contrasting uniquely with the lid. The Le Creuset French Press may be purchased from major retailers like Amazon, Williams-Sonoma, or Bed Bath & Beyond for around $70. 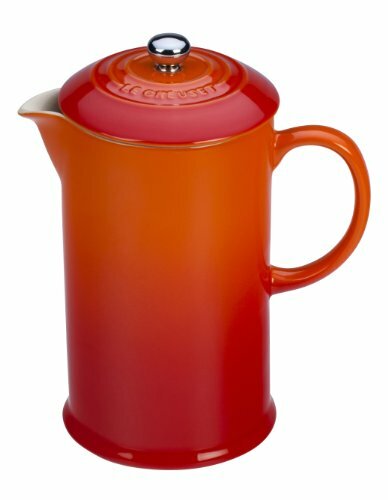 Though it is no steal for budget bargain hunters, the Le Creuset French Press maintains a reasonable place in the market. The price of this Le Creuset French Press falls slightly above most glass French presses, which may range from as low as $20 to as high as $70 or more. It is, however, significantly lower than many stainless steel French presses, which may sell for well over $100. The creamy enamel interior makes cleanup one of the most positive attributes of the Le Creuset French Press. With a stainless steel plunger and a single-layer stoneware lid, the Le Creuset French Press is less susceptible to smudging than glass models and avoids the hassle of bulky, multi-layer mesh filter pods. As far as manual French presses go in terms of heat retention, the Le Creuset French Press does an okay job. A strict coffee brewing aficionado may scoff at the rapid cooling of the pot, but with just enough volume to hold a little over two cups of coffee, the average joe drinker might well finish a pot and be on their way. Plus, the cooling of the pot will help slow down brewing to avoid an over-brewed, bitter taste. 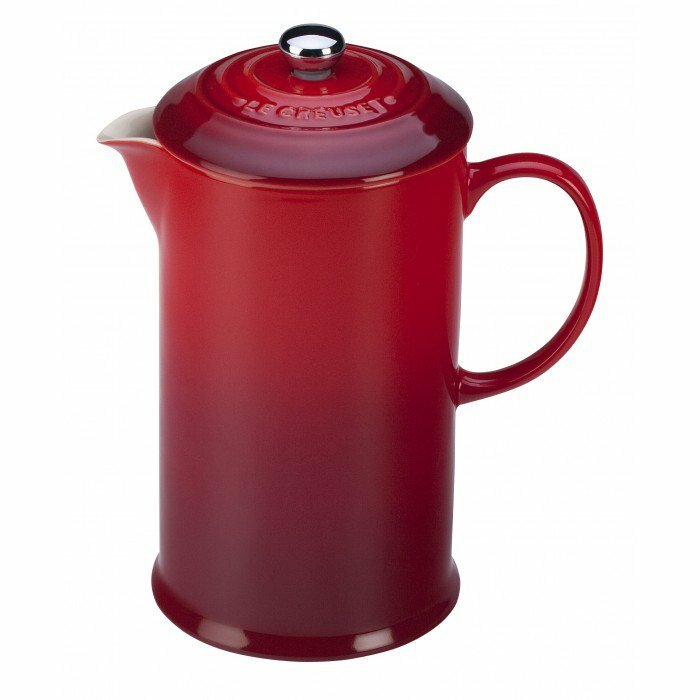 Paramount to the success of the Le Creuset French Press is its beautiful design. Some brewers put their faith in the aesthetic of their appliances alone, and if that is you, then you need the Le Creuset French Press. Consumers have noted that it is an unobtrusive and even lovely addition to their kitchen countertop. And, if you're a Le Creuset junkie anyway, then you simply must add this matching kitchenware to your collection. Aiding the ease of cleanup, the Le Creuset French Press is dishwasher safe. However, overall, it is a delicate piece that must be handled with great care to avoid cracks and chips. 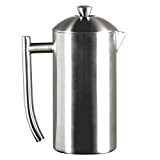 In general, consumers noted that they got far fewer uses out of this French press than what would be expected from an average French press. With its focus on looks over durability, the Le Creuset French Press might be best for serving coffee on small, special occasions. With its tall-and-wide approach and double wall vacuum, the Espro Coffee Press P7 comes to brew a lot and keep it hot (for a long time). Its double-layered filter is a hallmark which ensures that few silty coffee grounds make it into your deliciously brewed cup. Plus, once the plunger is fully pressed, brewing abruptly stops to ensure peak sweetness. The Espro Coffee Press P7 is relatively expensive, however, it falls near the median price for stainless steel French presses, which may run from an accessible $50 to an upcharged $150. Consumers of the Espro Coffee Press P7 report feeling confident that the quality and longevity justify the price. Espro French presses are most widely available for purchase on Amazon but may be found on specialty coffee shops like SeattleCoffeeGear.com. The Espro Coffee Press P7 is easy to pour, thanks to a long, balanced handle that nearly runs from the base to the mouth of the carafe. The double-layer filter is a bit more complex than the traditional French press spring mesh filter, which can make cleanup more cumbersome. But, maintaining a clean filter is an easy trade-off for the effectiveness of this catch-all basket. High-quality stainless steel ensures that this large brew tank maintains a professionally acceptable temperature. A rubber stopper surrounding the filter basket traps heat in a modern way that traditional French presses don't. With an insulating material and a tight seal, heat retention is one strong attribute of the Espro Coffee Press P7. While stepping away from the traditional model, the Espro Coffee Press P7 lands the aesthetic mark with a graceful, minimalistic, and functional appeal. Ultimately modern and attractive, the Espro Coffee Press P7 is sure to garner both form- and function-related compliments throughout the years. The mirrored stainless steel of this model shows no signs of wear or tear, and it even comes with a lifetime warranty. The balance provided by a long handle helps to create an even pour, even with a large 32-oz carafe size. 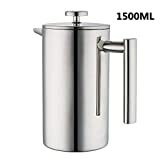 The largest of the French presses we reviewed, the Frieling USA Double Wall Stainless Steel French Press Coffee Maker holds 36 oz, or around four cups of coffee. With a tight-fitting lid and modern exterior surrounding a traditional stainless steel spiral mesh filter, the Frieling USA combines the best of time-honored and advancing brewing technologies. Frieling French presses can be found on large retailers like Amazon and Bed Bath & Beyond and coffee specialty shops like SeattleCoffeeGear.com. At a steep price of around $120, consumers of the Frieling USA were mixed about the value of their purchases. While the Frieling USA sits alongside high-quality stainless steel competitors, many buyers felt that a similar brew quality could be achieved with a French press costing less than half the price of this one. Generally, the Frieling USA is easy to pour. However, some users reported having difficulty cleaning a narrow spout or the sliding, ill-fitting lid when serving. 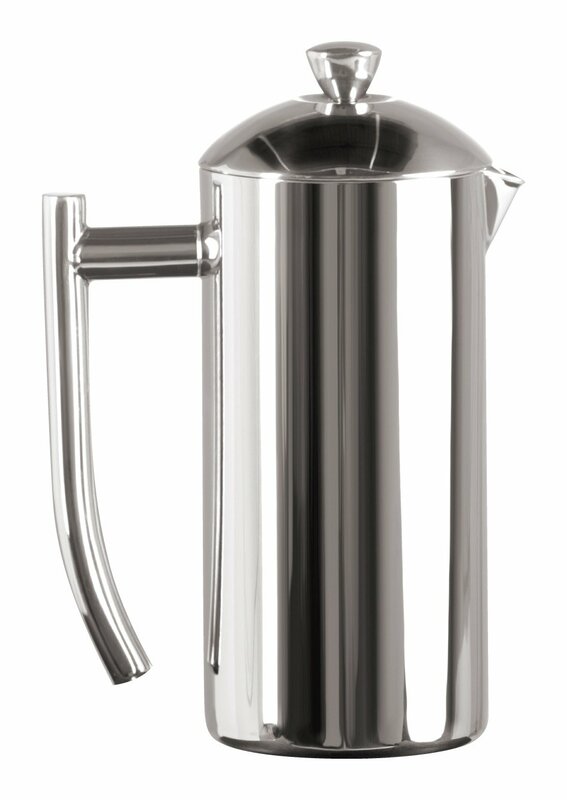 The carafe acts as a serving pitcher and claims that it traps heat four times longer than a glass French press. The plunger features a tightly sealed and attractive stainless steel lid — a stronger alternative to the wiggling, traditional plunger. Points must be detracted, however, for the size of the carafe. The 36-oz carafe may be good for serving a large group. But its sheer girth, coupled with a tight spout, will only add an unattractive metal pot to your kitchen countertop most days. Consumers described this press as solid. It does hold up over time and may be run through a dishwasher. The American Press Coffee and Tea Maker is your personal entertainment system. Get an inside look into the brewing action through a tall, clear carafe as it filters out a personal-size, 12- to 14-oz cup of joe just for you. 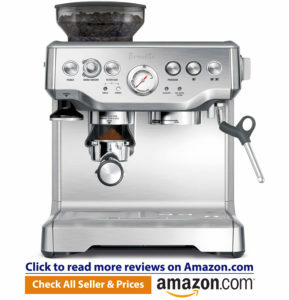 The American Press can be found on Amazon or a number of specialty and independent coffee brewing appliance websites. A price of about $80 is pretty steep for a single serving made by the It's American Press Coffee and Tea Maker, yet consumers rave about the quality. With a max volume of 14 oz, though, if this carafe were to break, we think it might just break the bank. The It's American Press Coffee and Tea Maker is touted for its on-the-go portability. Whether on a camping trip or in the office, this press guarantees to give you a quick kick wherever you go. The grounds can easily be emptied out of a reusable pod and easily reloaded. Many consumers said they appreciate how the plastic carafe stays cool to the touch while maintaining water temperature, although most coffee drinkers will finish the 12-oz serving in one cup. The It's American Press Coffee and Tea Maker's plastic carafe has its positives and negatives. The plastic is not BPA-free, however, consumers appreciate it for its portability and heat protectant outer shell. Overall, the aesthetic of the coffee maker, especially the modern, stainless steel lid, is appealing. Again, the plastic container holds up well against wear and tear, similar to a personal water bottle. The secure lid allows for endless transportation. 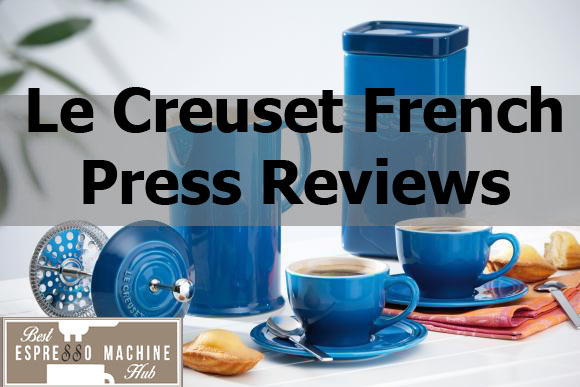 When compared with similar hand-press coffee makers on the market today, we give the Le Creuset French Press a rating of three out of five stars. Unfortunately, its quick-cooling stoneware and wobbly lid let heat escape in a way that updated glass and stainless steel models impressively don't. True, it is a fantastic editorial-looking addition to any kitchen, and a welcome addition to a fully furnished Le Creuset collection. However, it seems to be most practical for those looking to fill their kitchen with colorful decorations rather than coffee fanatics who obsess over the latest functional coffee brewing technology. 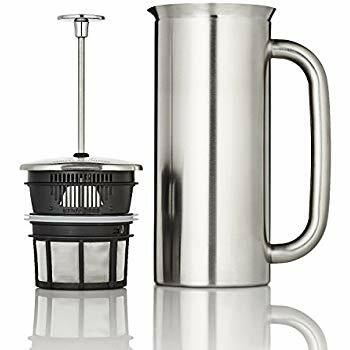 Whereas most coffee drinkers making the leap to hand presses from drip coffee makers are in it for the quality of the process and the taste, this French press will produce a solid cup of coffee but please your guests' eyes more than their taste buds. While it would make a perfect coffee server for small get-togethers and special occasions, the limited life of the Le Creuset French Press has been known to end in cracked, chipped stoneware pieces lying on the kitchen table. This may dissuade shoppers from its moderately expensive price tag. That said, it would make a thoughtful decorative gift.